Kent Valley Ice Centre, Kent, WA., Thursday, September 20, 2018 - The Metropolitan Hockey League (MHL) announced this week that their 2018-19 season schedule is currently under development. The MHL is shooting for an early October start to league play for most age divisions. Kent Valley Hockey Association members are encouraged to visit and become familiar with the MHL web site at www.metrohockey.org. Game schedules will be posted their once they are available. 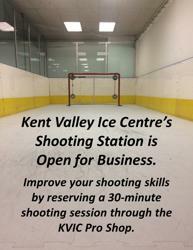 The Kent Valley Ice Centre’s new shooting station is open for business. Hockey players can schedule shooting times by signing up for a 30-minute session in the KVIC Pro Shop. Prices are $20 for 30-minute sessions or $150 for a 10 pack (10 30-minute sessions for a savings of $50). The shooting session is available by reservation only on a first-come, first-served basis. No skates are allowed in the shooting station at any time. Private or individual use is only available when the Fitness Centre is not being rented out by a team for team workouts. Teams that rent out the Fitness Centre also get the use of the shooting station as part of their workouts during their designated team workout slot. If they want additional private time after their team slot is completed, they must reserve and purchase those slots in the Pro Shop. A bucket of pucks will be provided for a player’s shooting session. When they are done, the shooter is responsible for gathering the pucks and returning them to the Pro Shop. Just a reminder there is no off-ice shooting or stickhandling allowed in the Kent Valley Ice Centre – other than in the designated shooting area inside the Fitness Centre. This is the result of the Ice Centre having to repair lights, exit signs, and damaged doors in the past. Please always respect the facility! Kent Valley Hockey Association is proud to call Kent Valley Ice Centre its “Home” rink, but we do not own the building, Café, Fitness Centre, Pro Shop or other amenities. We are one of several organizations that rent ice time in the building and we always encourage our membership to abide by all facility rules and treat the Kent Valley Ice Centre staff with courtesy. We are fortunate to have a facility that offers amenities like the On the Edge Café & Sports Bar, Pro Shop and Fitness Centre in-house! Thank you for your cooperation. Just a reminder that Team Managers will be meeting Monday evening in the upstairs banquet room at 6:00pm. Please make sure your team is represented at this essential meeting. KVHA Registrar, Rena Sullivan, will be distributing team binders and reviewing important team information, regulations and policies. If you are your team’s manager and are unable to attend, please make sure someone attends in your place.